Spent a delightful day out in Westport on Saturday searching for shorebirds with a nice group of folks who came from as far away as Florida, not specifically for my walk I might add – my reputation hasn’t reached that far…yet. First bird of the day was almost certainly the highlight as we picked up a Wilson’s Snipe sat out on the model airplane field at Sherwood, a somewhat surprising out of place bird that is quite rare at this time of year in Connecticut. Although there was plenty to enjoy there wasn’t much in the way of rarities and when we got to Grace Salmon it appeared that the birds this year are concentrating much of their time up near Gorham’s Island (see my birding map), which isn’t the best site for viewing the birds if they are just roosting in or around the marsh there. It also seems to be that the reported late summer in much of the arctic has lead to a somewhat delayed return migration for a lot of these birds although I did finally see a juvenile Least Sandpiper on Saturday (a first for the year). After the walk we popped up to Milford via Stratford Marina where I took the snap of this probable Long-billed Dowitcher (noted upright stance at rest, long legged look as well as plumage). Things seemed to be heating up a little there with nice numbers of peeps and a good mix of other more common species. Highlight were three stunning Red Knots in worn breeding plumage and a couple of White-rumped Sandpipers I was pleased to pick out of the throngs. 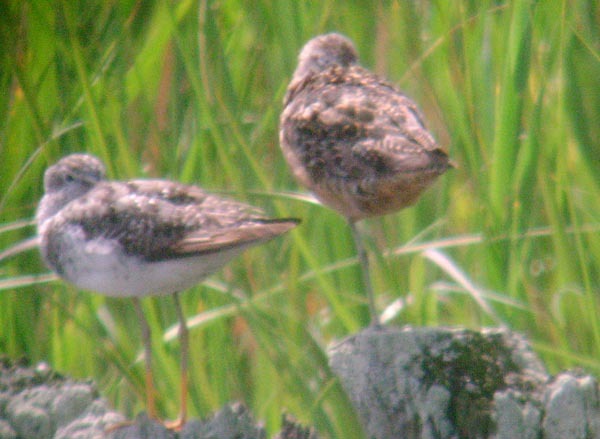 One of the Knots was banded and had a couple of colored flags on its legs. At such distance the letters on the flags weren’t visible (in fact it was hard to even decide what the colors were in the harsh light). I’ve stumbled on a few banded shorebirds before and they have always been from the Delaware Bay, less glamorous than one might hope. Anyway if you send in a report they generally get back to you with a nice thank you email and sometimes even a spiffy little certificate. Reports can be sent here. EDIT: Just thought I’d throw up this interesting article on Dowitcher ID. It has some helpful pointers. From a few offline comments it seems that the majority are coming down on the side of Long-billed. Hey Luke, still down in KY but I’ve had some internet access lately. Your dow does really look good for a LB, for the reasons you noted plus the dark back. If not a LB Dow it would be a ‘hendersoni’ Short-billed, which usually have broad golden “tiger stripes” on the back in alternate plumage. If so, that’s a great find. I’ve never seen an alternate LB Dow in Connecticut before…only a handful of juveniles some basic adults. Thanks for your thoughts on the bird. I appreciate your expert eye! Wish the photo had come out a little clearer. The bill was also certainly on the longer end of the spectrum as well – only briefly in view though. Glad to hear that you’ll be back soon. Need someone up at Milford to keep an eye on the action. Ahh…good time to be at the coast…but We are headed West now…MN our first stop ..to do some birding and then off to Montana. I will follow your blog to get my shorebird fix! Is it just my copy or did you really not include the 2 links you mention at the end of the LBDO post? The links are embedded in the text. Click the light gray words to go to the link.